We started the library eons ago. It was the second room we completed, but we have a long way to go considering we’re going to put in built in shelves, and I’m going to stencil the whole ceiling. Yikes. 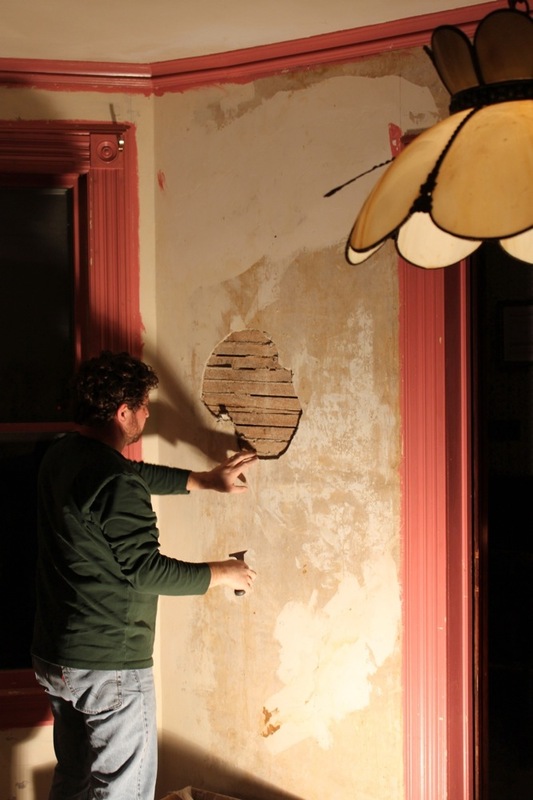 But, considering that the plastering is completed and it is a viable, usable room, here are the pictures of our process. When we first looked at the house, there was a large pool table in the room and nothing else. 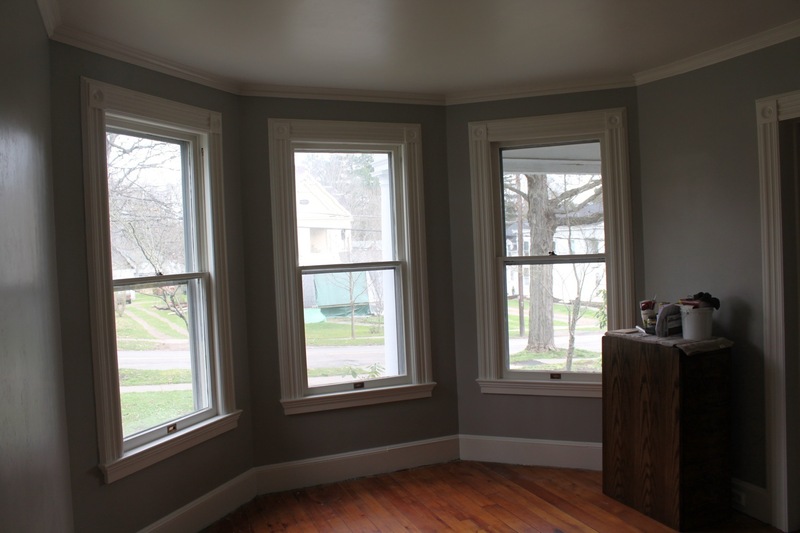 The middle window had been sealed up and boarded over from the inside and siding put on from the outside. So, from the outside, it didn’t appear there was a window. The interior colors were pink and off white wallpaper, with a glass Tiffany wannabe light hanging in the center of the room. 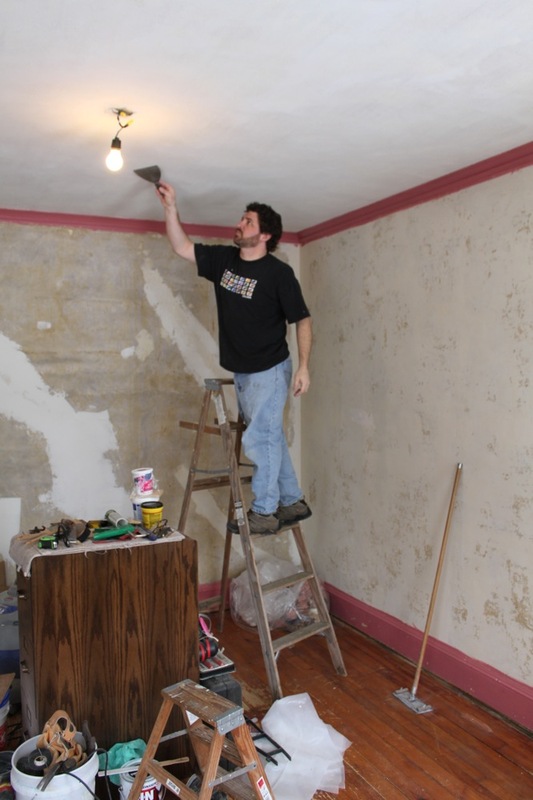 I began by removing wallpaper, which was rather easy in this room, considering it was put on correctly. It took me weeks, but it came down smoothly. Bill had to re-plaster one whole section of wall, by first removing old plaster and the filling in. 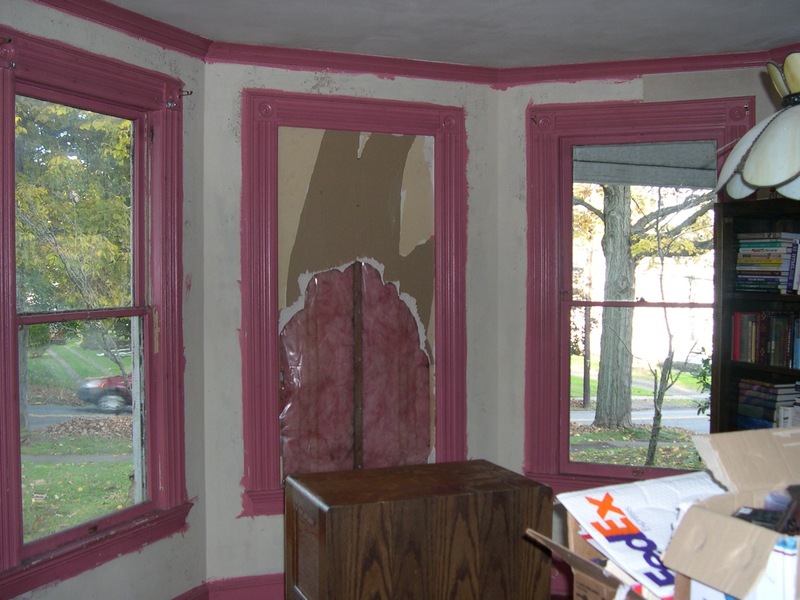 The plaster had been severely damaged and was quite soft. It wouldn’t have worked just to put on our mesh and go over it with joint compound. You can see from this photo the lath underneath. It is super cool to see how the house was put together. And, from this work, we were also able to see the horsehair in the plaster. Yup, real horsehair plaster for those that aren’t familiar. I suppose it gave the plaster more structure to adhere. 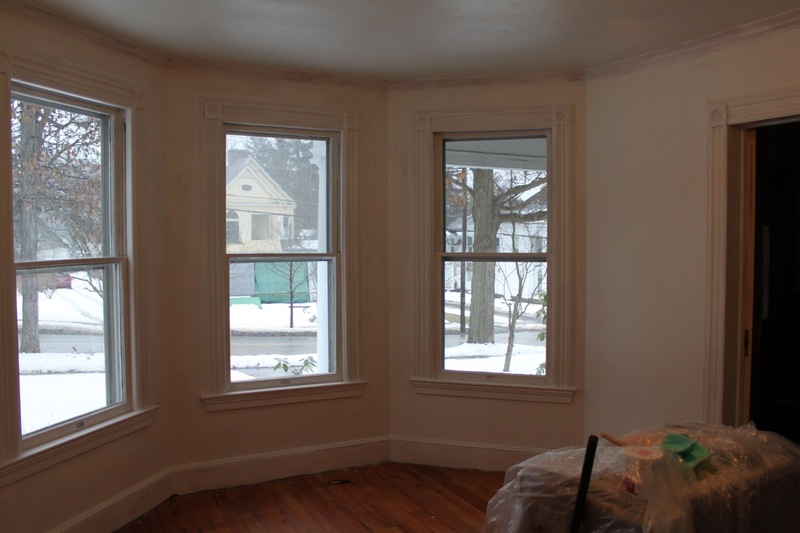 Once the repairs were complete, the wall paper removed, we fixed the double hung windows, re-plastered the ceiling, primed and painted the whole room. We also fixed these pocket doors. They were the first ones we tried to repair and learned how to do so in the process. All of the doors hang on tracks, and they can be adjusted up and down as needed. Since the doors are solid cherry, they are quite heavy. And, with constant use over 100 years, they have begun to hang low and expand. With a little work, we were able to raise them on the tracks and get them moving again quite easily. We did not, however, remove them completely to refinish the back sides. I would like to do that at some point so they match the interior woodwork, but it is a ways off. Currently, we use the room as an office, with both of our desks. We are also letting Will nap in there regularly because it is quiet and dark, and I can be downstairs with him all day this way. It works well for a variety of purposes, but it isn’t decorated or attractive this way. The upcoming shelving project will do a lot to enhance this room. Bill will build all cherry shelves along the two full walls and I will stencil the ceiling to give the room more character. I suppose if we are lucky we’ll be able to start on this room in the fall. We have to complete the nursery and refinish the downstairs floors before then, so I can’t guarantee our timetable. Of course, I will show pics of Bill’s process on the shelves and the stenciling along the way. Both of you do beautiful work. 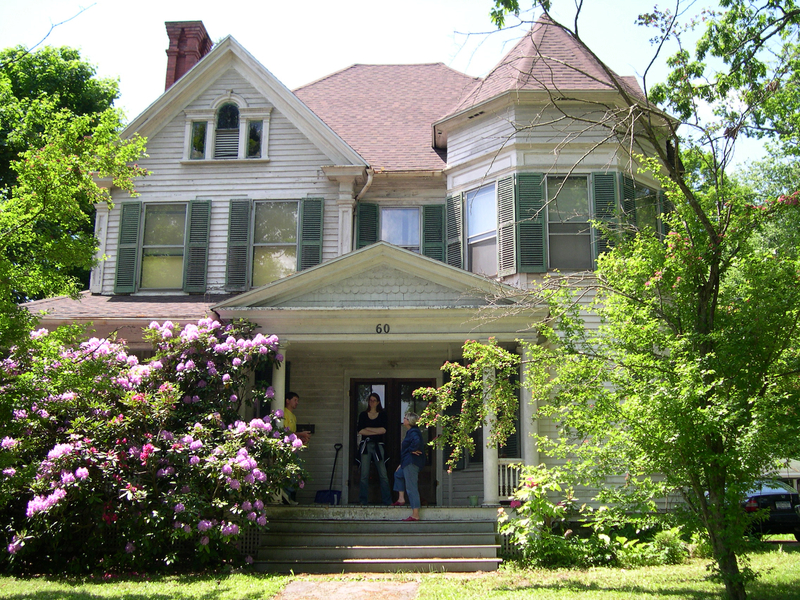 Our house is plaster, too. It doesn’t have horsehair, however. Plaster houses are very sturdy. They just require maintenace when the walls get hairline cracks. Sorry I didn’t respond sooner cousin and aunt! 🙂 No, Will isn’t a great napper and we don’t have the energy yet to keep going, but we’re getting there. He is getting better at sleeping and we’re feeling better. Thanks, Donna! It is sturdy and yes, a bit of maintenance. I’m lucky to have a good husband in Bill to keep up with it all.